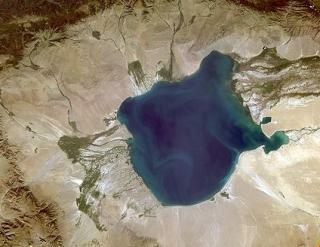 The Uvs Nuur Basin covers a range of diverse ecosystems within the closed catchment of the saline Uvs Nuur lake system. Uvs Nuur is an 'inland sea', that is frequented by a range of seabirds even though the nearest ocean is 3,000km away. It is almost circular and 70km in diameter. The surrounding area consists of steppes, mountains, forests, wetland and deserts. It supports a variety in birds, both resident waterfowl and migrating birds. Mammals include snow leopard, mountain sheep (argali), marbled polecat and the Asiatic ibex. This serial nomination consists of 12 strictly protected areas. It lies partly in Tuva (Russian Federation) and Mongolia. The site is inhabited by semi-nomadic pastoralists. Holocene: During the Holocene, the current ecological "mix" was created.